This Marksman Laserhawk Tapered Band Slingshot 3055 has a tapered band that offers 30% more velocity than the regular Marksman band. It has a folding design and has a wrist support that can hold slingshot ammunition. 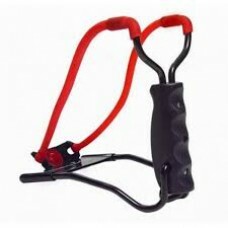 * State laws prohibit us from shipping or selling slingshots to residents of Massachusetts and New Jersey.